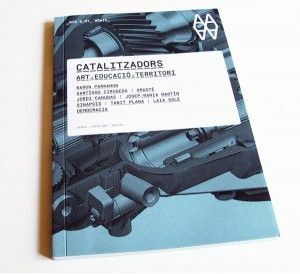 This publication contains the projects shown at the exhibition Catalysts. Art, Education, Territory, presented in Arts Santa Monica (23.12.2010-03.04.2011) and co-produced together with ACVIC. This publication brings together the texts and works of Santiago Cirugeda, Amasté, Jordi Canudas, Josep-Maria Martín, Luca Giocolli, Sinapsis, Tanit Plana, Laia Solé, Democracia and Ramon Parramon. It is a set of art projects and participatory processes which posit a direct relationship with a particular local context. These proposals integrate three essential components, relating and interacting among themselves, to varying degrees: they are artistic practices, they promote educational activities and are deployed, without sacrificing a social, politic and critical reflection, in a specific area or context. Project curated by Ramon Parramon. Catalitzadors. Art, Educació, Territori. Eumo Editorial i Arts Santa Mònica, Vic-Barcelona, 2010 ISBN 9-788497-663939 Catalan edition with spanish and english translation. The price of the publication is 12,00 euros plus sending costs.